How does SPSE work? What does it look like on the ground? 1. A team of at least two Catholic evangelists choose a place in their city or town with a moderate to high level of pedestrian traffic. Examples of suitable locations include an open-air market, such as an art fair or farmers’ market; a bus-stop or subway station platform; a public park. 2. The evangelists “set up shop” with a sandwich-board sign and a collection of materials: assorted pamphlets on aspects of Catholicism, holy cards, Rosaries, Miraculous Medals, etc. A small table or blanket is often useful for displaying the materials and drawing the attention of passersby, but it is not essential. 3. The evangelists then say a prayer, invoking the Holy Spirit to guide their efforts for that day, asking to be courageous, humble, and docile to His promptings. They ask through Our Lady’s intercession for the Lord to send them the people He desires them to encounter, and they pray that all may be done for the greater glory of God. 4. 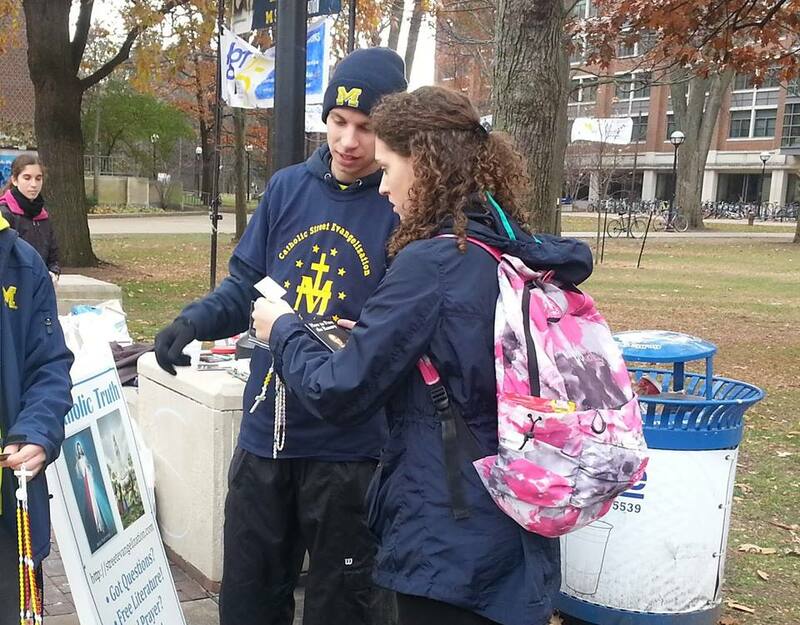 At this point, the evangelists simply wait for passersby to draw near and offer them free Rosaries. When someone stops to take a Rosary, the evangelizers also provide a pamphlet on how to pray the Rosary and attempt to further engage the person. A question that is often effective is “Are you Catholic?” as the answer can provide a springboard for further conversation in many different directions. By asking follow-up questions, the evangelizer can discover whether a person is a practicing Catholic, fallen-away Catholic, Protestant, New Ager, atheist, etc. — information that is key in guiding a conversation to meet that person where he or she “is at.” It is recommended to pray the rosary while waiting for people to approach or in between conversations. 5. The above is the primary approach of St. Paul Street Evangelization. Our secondary approach, which involves door-to-door evangelization, may be used in locations that do not have an acceptable location to carry out our primary approach, or during the colder months of the year when people are less likely to be out and about. Like our primary approach, the evangelists conduct themselves in a non-confrontational way by politely introducing themselves and then asking if the homeowner would be interested in talking briefly about the Catholic Faith. 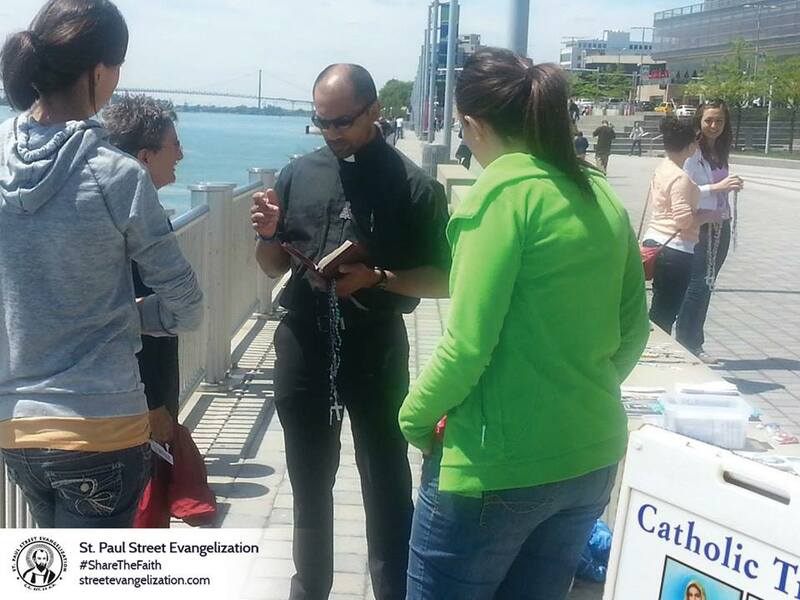 Before doing door-to-door outreach, St. Paul Street Evangelization requires our teams to get permission from the local pastor before evangelizing those within his parish boundaries. 6. Keep in mind that the evangelists are there to be a public witness to the Catholic Church and to be obedient to the Holy Spirit. They should be charitable, good listeners, willing to pray with people, humble. They are not to be argumentative or combative, but should certainly defend and explain the truths of the Catholic faith and challenge their listeners in a spirit of sincerity and compassion. They should remember that Christ said that those who are persecuted for His sake are blessed and should not let a conversation they perceive as a failure get them down. God works in all situations. 7. 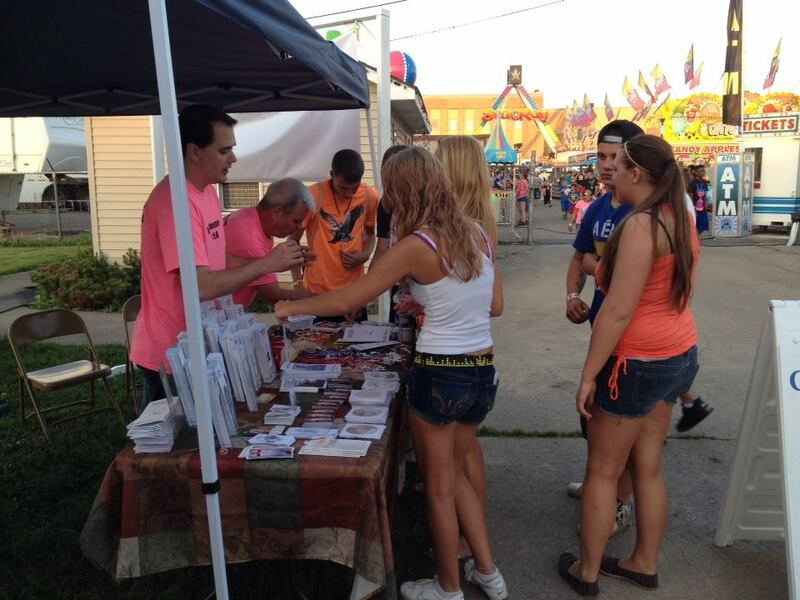 While using this non-confrontational method of evangelization can be very effective at strengthening the faith of practicing Catholics, bringing back into the Faith fallen away Catholics, and converting to the Faith non-Catholics, we recognize that it is our job to plant seeds, and in the end, it is up to God to make those seeds grow.